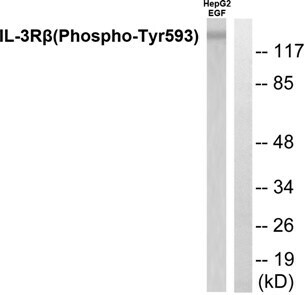 ab53695 detects endogenous levels of IL3RB only when phosphorylated at tyrosine 593. Synthetic peptide corresponding to Human IL-3RB. Human brain tissue and RAW264.7 cell extracts treated with G-CSF (25ng/ml, 15mins). ab53695 was affinity-purified from rabbit antiserum by affinity-chromatography using epitope-specific phosphopeptide. The antibody against non-phosphopeptide was removed by chromatography using non-phosphopeptide corresponding to the phosphorylation site. Our Abpromise guarantee covers the use of ab53695 in the following tested applications. WB 1/500 - 1/1000. Predicted molecular weight: 97 kDa. ab53695 at 1/50 dilution staining IL3RB in human brain by Immunohistochemistry, Paraffin embedded tissue, in the absence or presence of the immunising peptide. ab53695 has not yet been referenced specifically in any publications. Publishing research using ab53695? Please let us know so that we can cite the reference in this datasheet. There are currently no Customer reviews or Questions for ab53695.